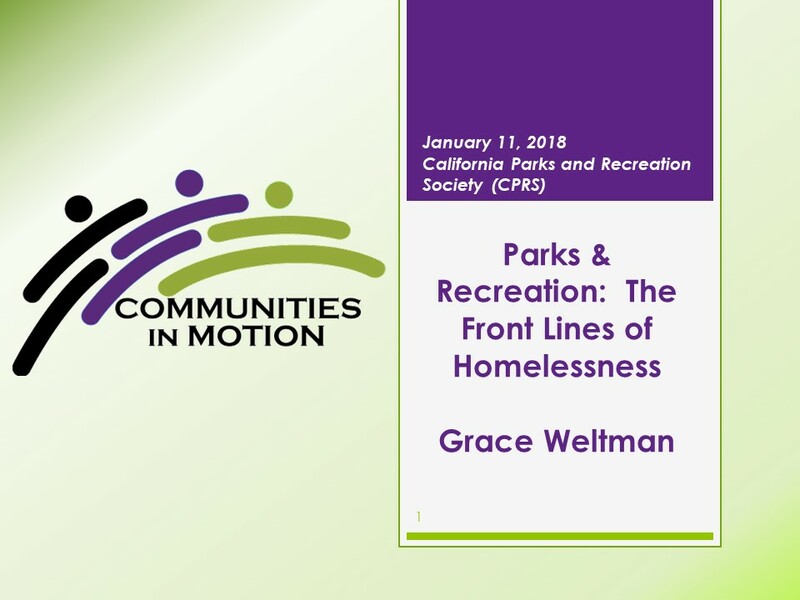 On Jan­u­ary 11, 2018, Grace Welt­man was the keynote pre­sen­ter at the Cal­i­for­nia Parks & Recre­ation Soci­ety D10 Train­ing held at the Nor­man P Mur­ray Com­mu­ni­ty & Senior Cen­ter. “Parks and Recre­ation: The Front Lines of Home­less­ness” focus­es on the chal­lenges faced by parks and recre­ation staff faces n respond­ing to home­less­ness, out­lin­ing some approach­es to proac­tive­ly respond­ing as Cal­i­for­nia con­tin­ues to face a home­less cri­sis in many cities and regions. Jes­si­ca Polk of the South­ern Cal­i­for­nia Health & Reha­bil­i­ta­tion Pro­grams (SCHARP) pro­vid­ed a per­spec­tive from those who work dai­ly with home­less indi­vid­u­als, help­ing to high­light the impor­tance of proac­tive engage­ment when it comes to home­less­ness.